Japan's space agency is looking into the possibility of sending a Twitter-using humanoid robot to the International Space Station to act as a talking companion for astronauts on the orbiting outpost, according to news reports. The Japan Aerospace Exploration Agency (JAXA) announced this week that it is considering a plan to equip the space station with a humanoid robot in 2013 to keep watch over the outpost while astronauts sleep, according to the Associated Press and AFP wire services. The robot could also monitor the crewmembers' health and stress levels. The robot would also be able to "talk" by communicating with people on Earth and sharing photos through Twitter, according to the AP. "We are thinking in terms of a very human-like robot that would have facial expressions and be able to converse with the astronauts," said JAXA engineer Satoshi Sano, according to the AP. Development of the robot is being spearheaded by JAXA, advertising and communications giant Dentsu Inc. and a team at Tokyo University. 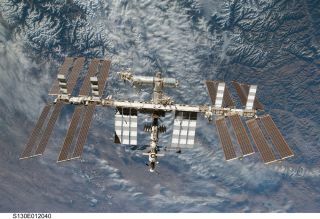 Having a robot operate on the space station would also help foster similar research on the ground, particularly on the potential uses of humanoids on Earth, JAXA said in a statement. Plus, the Japanese android will already have a robotic pal on the space station – NASA's own 300-pound humanoid robot, Robonaut 2, is set to launch on the space shuttle Discovery next week. Robonaut 2, or R2 for short, has a human-like head, arms and hands, and will assist astronauts with mundane tasks, like cleaning, in the space station's Destiny laboratory. Currently, Robonaut 2 has limited mobility, but in the future, the project's designers are hoping to modify the robot to allow it to move freely around the station's interior or outside the orbiting complex, as a stand-in for astronauts on more dangerous spacewalks. JAXA hopes to improve on Robonaut 2's capabilities by also providing a more communicative companion for the crewmembers living onboard the space station.